From Ko Chang we took a sawngthaew(pick up truck with benches in the back), a ferry, another sawngthaew, a bus, and then a tuk tuk and around 6 pm we arrived at the Thai border town of Araynaprathet. We were hoping to make it to our Cambodian destination in one day, but have come to the realization that traveling from place to place in SE Asia is going to be no small feat. The next morning we grabbed another tuk tuk and headed to the Cambodian border. Our driver stopped about a km from the border and tried to get us to buy our visa at a small office. There are several scams where people will try to get you to purchase your visa for 1200 bhat which ends up being fifteen dollars more then the actual visa costs at the border. We were ready for this and just said no thanks. I guess it pays to do some reading before you travel. The Poipet border crossing took about 3 hours. When we were done a "free" bus took us to the "taxi stand". I put these in quotations because nothing in southeast Asia is free and the taxi stand was actually the taxi mafia. They get you several miles out of town and then charge you inflated prices to take you to your destination in Cambodia. You can share a taxi with people to make the fair cheaper, but we were not going to Siem Reap which is were Ankor Wat is, the most popular attraction in Cambodia, so we could not find any to go with us to the much less touristy Battambang. After waiting around for about an hour we were approached by another couple who looked equally as frustrated. We all decided to take a taxi together. They were going to Phnom Penh which was several hours past our destination but said they did not care to spend a night in Battambang. They just wanted as far away from this taxi scheme as possible. We ended up having alot in common, had delightful dinner in Battambang and they invited us to Sihanoukville on the southwest coast of Cambodia. This is how we met the recently married Canadian couple Maggie and Travis who we would spend the next six days with. 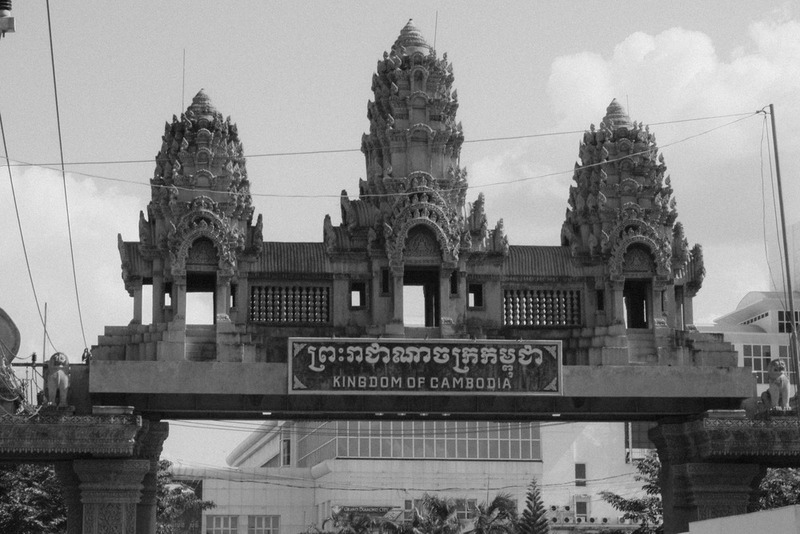 The next morning we took a bus to the capital of Phnom Penh. The drive was amazing. The country more beautiful than what we had seen in Thailand and the poverty more apparent. It was the Cambodia that we were waitng to see, bright green rice paddies sprinkled with palm trees, wooden houses on stilts, water buffalo, rice drying on canvas, people working in the fields and kids running around in their skivvies. Every stop we made people would smile at us and kids would wave. It was too picturesque for words, but we were on a bus and couldn't take any photos. We got our first taste of Khmer food and begging children at a rest stop. They plopped noodles in a bowl and you picked from several pots of soup containing some undisclosed meat and some veggies. It turned out to be rather good and gave us an opportunity to use our riel (the Cambodian currency) their are approximately 4000 riel to the dollar. At the public bathroom ( a squat toilet...meaning a hole in the floor that you squat over) their was a little girl begging. The guide books suggest that you do not give money to beggars because it will only enables them and the kids will probably not see any of it because they give it to their parents, but she had the sweetest smile and I could not resist. Compared to Phnom Pen the traffic in Bangkok is the perfect picture of organization. The place was complete madness. There are very few street lights and we saw one stop sign in a city of two million. On our tuk tuk ride the driver just edged out into oncoming traffic and it eventually went around us or stopped. Crossing the street is much like playing frogger. We stayed at OK guesthouse, which the guidebook says is "more than OK" and it was correct. We got a room for eight US dollars or 32,000 riel. The room had a list of warnings for Phnom Pehn which included...Do not buy a tuk tuk driver a new tuk tuk if he says his is broken, because he is probably lying and will keep your money, your a tourist not an ATM. Also that prostitution is illegal, but if you are going to bring a prostitute back to the guesthouse be courteous to other guests and be aware that they may drug you and take your money. After we read this our plans for the evening were ruined, so instead of getting a prostitute and buying someone a tuk tuk we decided to go to dinner at a Mexican restaurant. 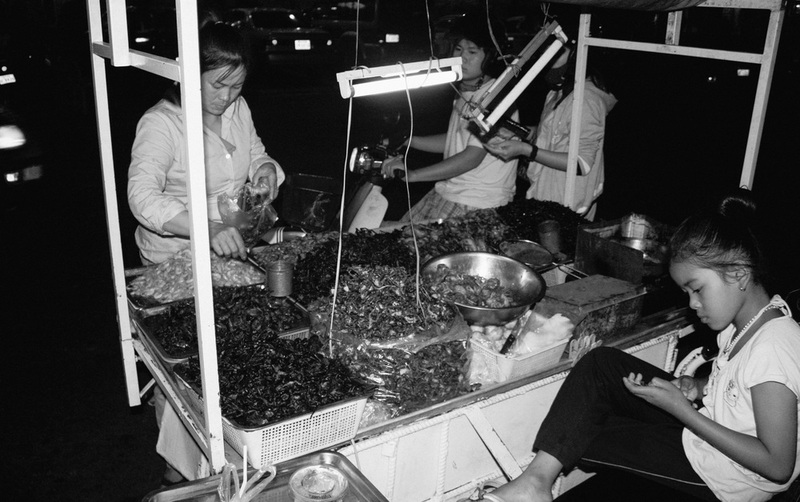 On our way we passed a cart of cooked insects. 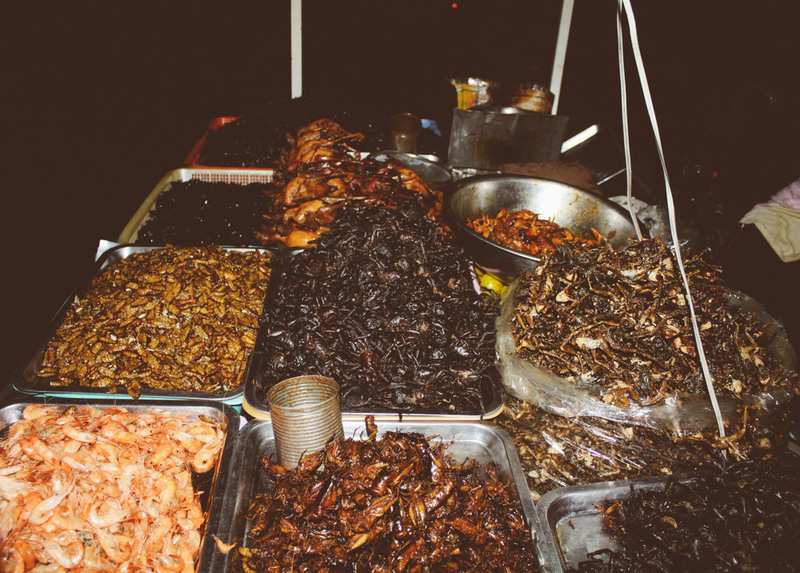 Eating bugs is part of the Cambodian cuisine. 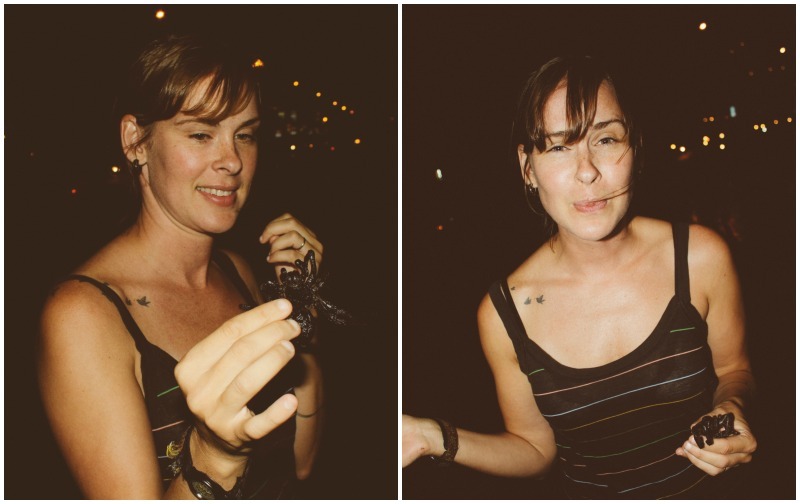 I had mentioned to Travis that i was going to eat a fried tarantula and he volunteered to eat one as well which helped to strengthen my resolve..........I almost changed my mind when I touched it. For the next few hours we were picking tarantula parts out of our teeth.